Zhangjiajie National Park famously was the inspiration for the Avatar movies. Zhangjiajie is just one part of the Wulingyuan Scenic Area and it truly is beautiful. Ethereal almost. Magical certainly. It’s also confusing, busy and big. There are a number of challenges involved in visiting Zhangjiajie – so here’s our Zhangjiajie Guide and Itinerary. What happens when you don’t book a train ticket. Zhangjiajie Railway Station – the closest train station, which is about an hour from the Zhangjiajie National Park. We’ve outlined this in stages – as you can stage your journey, but it’s also important to understand the different areas that are referred to as Zhangjiajie. It’s also important to book your hotel in the right place, to ensure that you spend the maximum time in the Park rather than getting to it! Here are our recommendations as to where to stay in Zhangjiajie – it’s essentially in the township area called Wulingyuan. Excellent location just 5 minutes from the entrance to the National Park and near the Wulingyuan to Zhangjiajie bus stop to the Railway station. Small hotel with good sized rooms. Easy access to the restaurants of Wulingyuan and also the national park entrance. Wulingyuan Scenic Area was designated as a UNESCO World Heritage Site in 1992. It consists of smaller national parks and scenic areas these include the Zhangjiajie National Forest Park and Suoxiyu Nature Reserve, where you’ll find Baofeng Lake and the Yellow Dragon Cave. The place that MOST folks want to visit is the Zhangjiajie National Forest Park. This is generally known as Zhangjiajie National Park and it’s the one that the Avatar movie made famous. Zhangjiajie is the most famous part of the Wulingyuan Scenic Area and it’s where we visited. You can see these on the map Zhangjiajie National Forest Park below, courtesy China Highlights. In order to visit Zhangjiajie National Park you first need to get to what is called Zhangjiajie City. This is where the Zhangjiajie Train Station is located. You will probably arrive here by train. 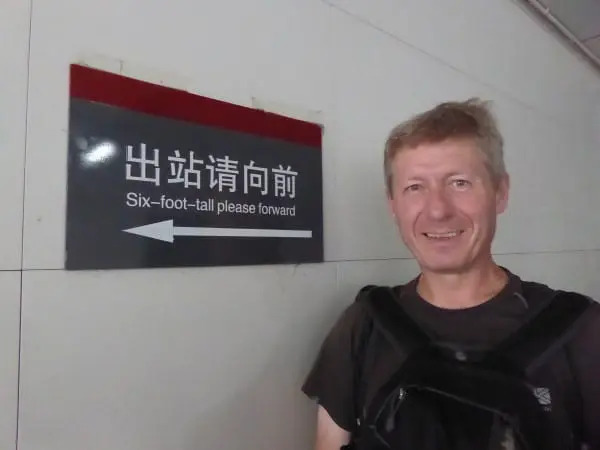 There are reasonable connections here, but the Chinese Train service is busy, so book your train tickets WELL AHEAD OF TIME. You can also take buses from Changsha and from Guilin, although we found the trains to be the most comfortable way to travel in China. Amuse yourself as you leave the train station with some of the signage, like we did. It is possible to go directly from Zhangjiajie Railway Station to Zhangjiajie National Park. The distance between these two is 32 kilometres. This is the bus from Zhangjiajie to Wulingyuan area. Taxi drivers are unlikely to want to use the meter. Agree a rate before setting off, the usual rate is 100 YUAN. The Zhangjiajie National Park is on the outskirts of the Wulingyuan Township. This is where you will need to take your taxi or transfer to. Or, if you’ve arrived on an overnight train, head straight on up to the National Park. You will be doing Zhangjiajie (and your budget) a disservice, however, if you only spend one day in the park. 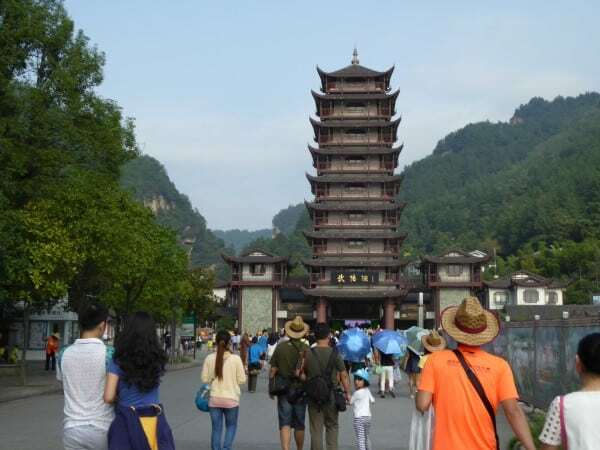 If you are traveling on a budget, as we do, then you should take the public minibus to Wulingyuan Township, which is the closest town to Zhangjiajie National Park. The Zhangjiajie Wulingyuan Bus leaves from the Zhangjiajie Bus Station. That’s easy to find from the Zhangjiajie Railway Station. As you leave the train station, you’ll find a set of sign posts. You want the Central Bus Station. On the photo of the bus station signs, it is literally the building with the advertising posters on it in the bottom right. These are the only signs you are likely to spot in English. There is an information booth in the central Zhangjiajie bus station but this was not manned by an English speaker. You’re best to have written down in Mandarin that you want to go to WULINGYUAN. Here’s what what looks like. 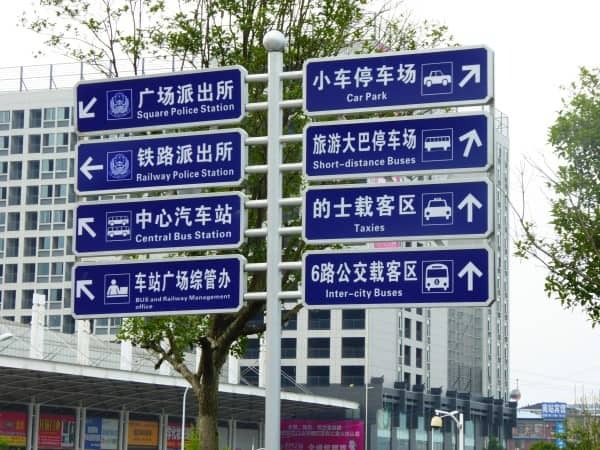 The Zhangjiajie to Wulingyuan bus is easy to find and only costs 12 CNY (GBP1.20, US$2.00) As you leave the train station, you’ll find a set of sign posts for the Central Bus Station. It’s very close. Buses that go from Zhangjiajie to Wulingyuan are minibuses (15-18 seaters). They leave from BEHIND the Zhangjiajie Central Bus Station, however you find the entrance from inside the building. 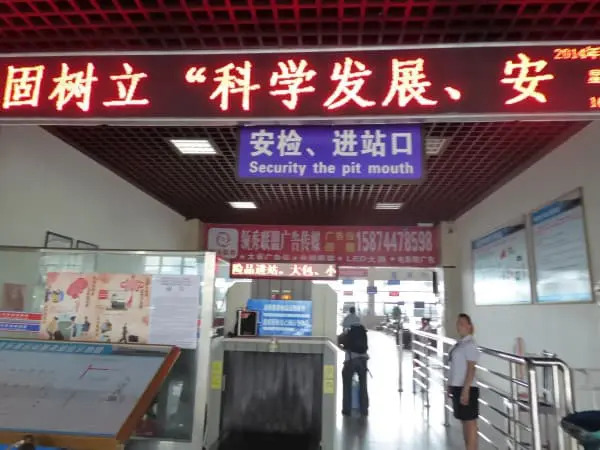 Inside the Zhangjiajie Central Bus Station follow the signs through the Security – the pit mouth sign. Then follow this sign to the Wulingyuan bus. Buy a ticket from the driver. Buses leave during the day on average every 10 minutes. The trip takes an hour and the final bus stop in Wulingyuan is outside the Santa Domingo Hotel. 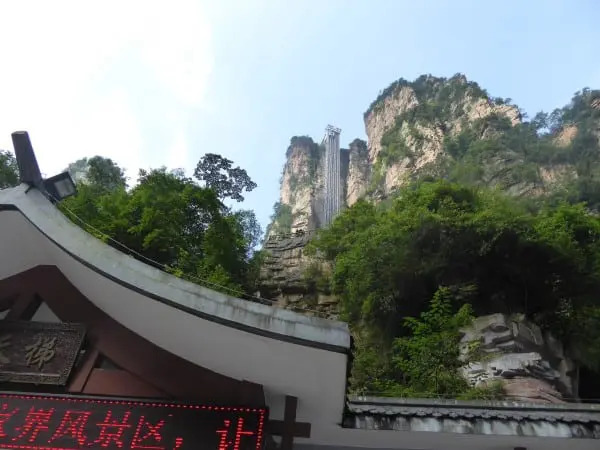 Once you’re in Wulingyuan it’s easy to walk to the entrance to Zhangjiajie National Park. 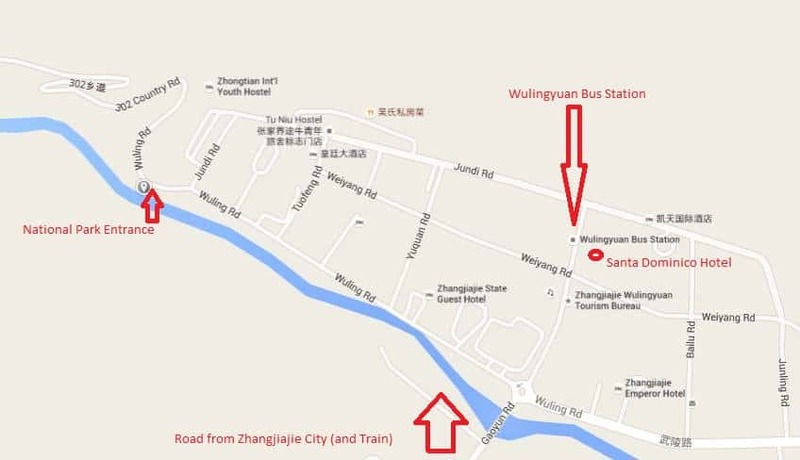 This Wulingyuan map shows you where the entrance to the National Park is with relation to the bus stop and some hotels in the town. The Zhangjiajie National Forest Park Entrance Fee is expensive, at 248 CNY per person in the high season. However, this does include the buses inside the park and your pass is valid for four days. And this is why you don’t just want to spend one day here. Our Zhangjiajie Itinerary called for us to spend two days here. 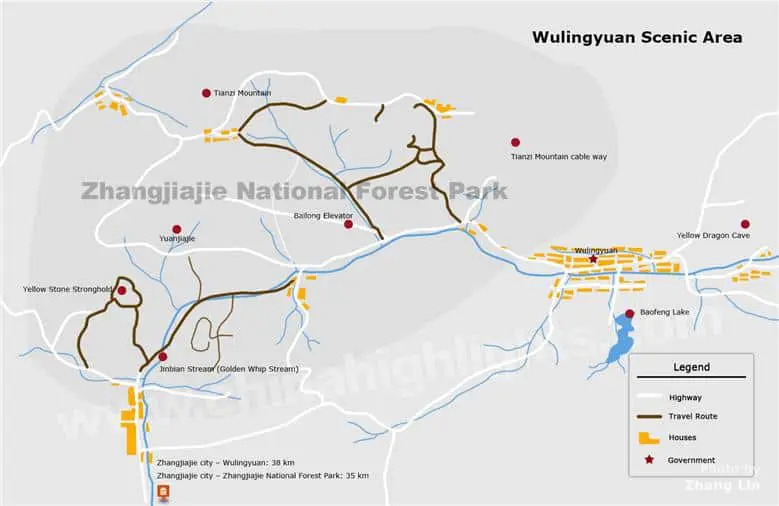 The buses are necessary as you’ll see from the Zhangjiajie National Forest Park map below. It is a 10-15 minute bus journey from this park entrance to the main areas that you will want to see. Not only that, but the road might be two way, but there are no footpaths alongside it. 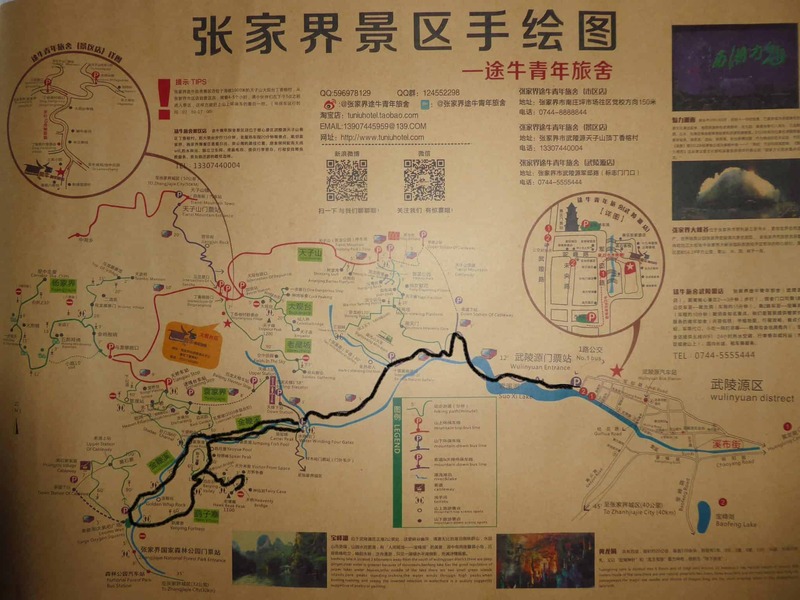 This Zhangjiajie park map comes from the Tu Nui Hostel, where we stayed. The best version of the Zhangjiajie National Park map we found is below. When you buy a ticket you’ll receive a chip card and you also need your thumb print to go with it, so you can’t sell the ticket on to someone else. There are essentially two levels to Zhangjiajie – the lower and the upper level. When you enter the park from Wulingyuan you enter on the lower level. At this point you HAVE to get onto a bus, as there are no walking trails from here, only roads. Theses buses are free and necessary. They will take you to all the main areas that you’ll want to walk in and see. 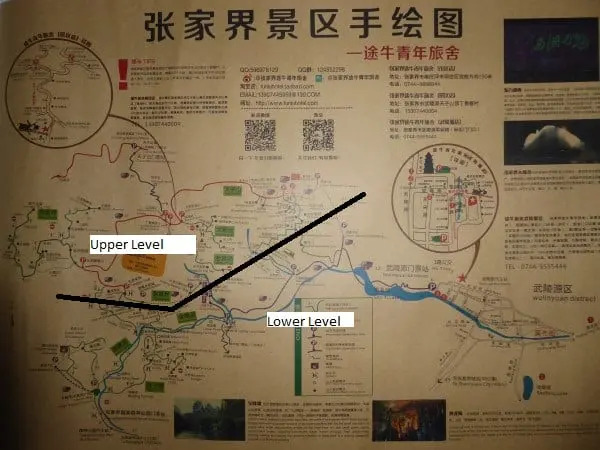 It’s possible to walk up from lower to upper, from the Golden Whip Stream (See Wulingyuan National Park map) for instance, in about an hour. Or you can take one of the several cable cars (check if they are running when you get to the park.) You can also take the Bailong Elevator to go between the upper and lower levels of the park. We spent two days in Zhangjiajie National Park. The first day was a Sunday and it was incredibly busy. Here’s the route that we followed on our first day marked on the map. You’ll see from the first map comparison that the bus journey to the first stop is quite long. There’s no walking trail alongside the road. Once you get to walking trails they’re mostly reasonably wide – apart from when you’re going up hills, or close to the attraction areas. Of course, it also depends on how many people are in the park! On our first day in Zhangjiajie National Park we bought our tickets, got on the bus. There was a little confusion initially as there are multiple buses. Be sure to ask the attendants for the location that you’re looking for. We headed straight away for the Bailong Elevator (this is sometimes called the Wulingyuan Elevator). 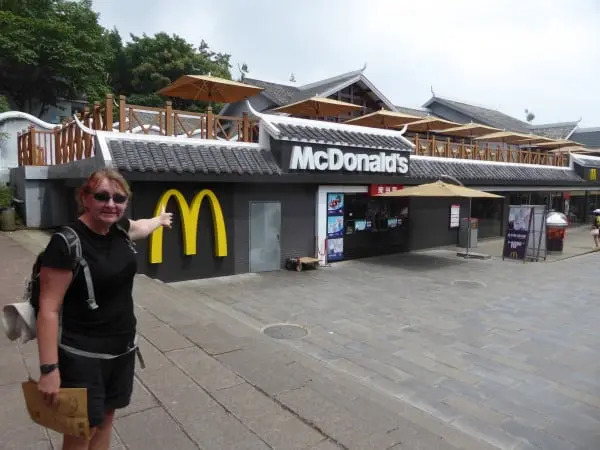 It was on our list of places to visit in Zhangjiajie. This monstrosity built on the side of the cliff costs 72 Yuan each to go up. We queued for about 40 minutes, in the rudest, most obnoxious queue we’ve found in China. I think my calves are still bruised from the childs buggy being used as a weapon of mass people moving. The ride is short and you’ll want to get to the glass window side – if you want to see anything. The glass was scratched, so photos out of the window aren’t the best. If you don’t like heights, leave it alone, the elevator will be full and you’ll be uncomfortable. There’s a huge McDonalds at the top (see map for location) if you’re in need of American style sustenance. There are also lots of snacking places to eat, including, at the top of the Bailong Elevator and after the short bus ride – several restaurants. We couldn’t find anywhere that had English signs or that spoke English. In our trip we didn’t see any other western tourists at all. We ate snacks from the various vendors. The park is beautiful. The mountains are ethereal, the smog adds atmosphere, but the sheer number of people take it away. It was busy. Zoo like busy. Pushing, shoving, and none of the courtesy that we’d seen in Huanglong. Perhaps as a result of the large number of people everything feels like you’re rushing. The buses screech along at high speed, not slowing for pedestrians. They use their horn longer and louder rather than braking. Most of the tourists that we met were in large groups – so we got stuck rushing to get in front of them, or behind them. Or marooned in the middle. Our second day in the park was much quieter. It was a Monday and the crowds were much more manageable. We took the bus to the Golden Whip Stream and hiked the loop around it – plus several off shoots. The hike is easy, even in the heat of late summer, and it’s mostly out of the sun. Once you are about 20 minutes walk away from the bus stop the crowds just thinned out. 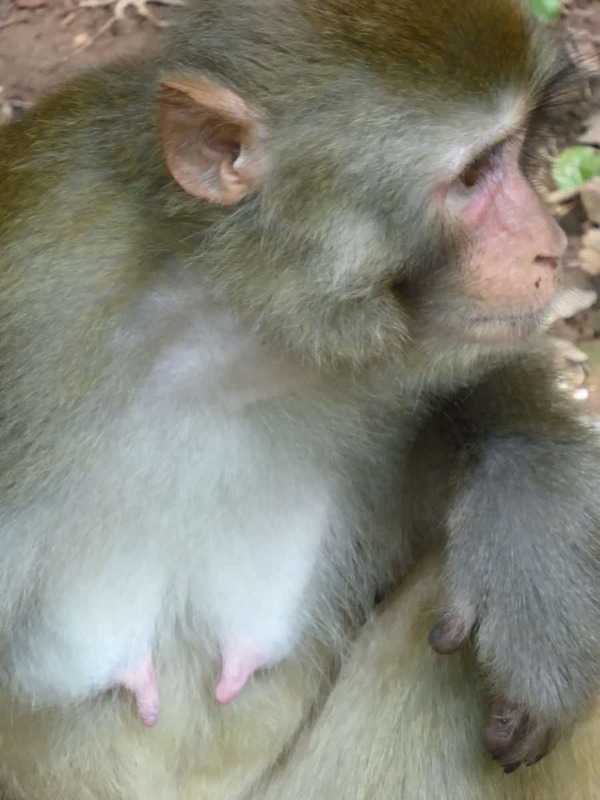 At the turn around point – where the woods open up to the green area you’ll find lots of monkeys. And lots of monkey feeding. If this is your first foray into a Chinese National Park, you just need to get used to it. Despite the signs of don’t feed the animals, this appears to be a national pastime. As is the cheering outrage when a monkey gets cheeky and steals. We exited the park and picked our bags up from the Tu Nui Hostel. The walk back to the Wulingyuan bus station where we were dropped off took us 10 minutes. From there we took the bus back to Zhangjiajie City, buses leave every 10-15 minutes. 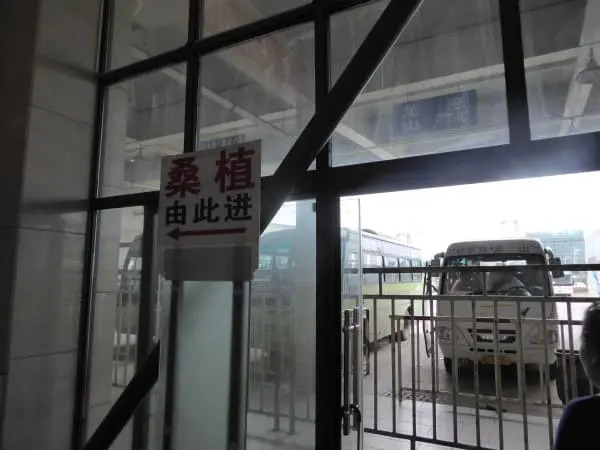 There are buses that leave from various stations back in Zhangjiajie City, but we couldn’t find one to go to Guilin, our next destination, so we took a tortuous train journey via Changsha that involved spending most of the night on a station. Not, you understand, because there is anything wrong with the Chinese train services, but because we hadn’t booked ahead of time. If you need a reminder to book a train ahead of time, then here it is. We booked our tickets on the day of travel, so we were lucky that there were any available at all. This involved a a 7 hour train to Changsha. It would arrive at just after 1am and we would wait there until 430am for another 7 hour train to Guilin, we would arrive in Guilin just before noon. The only seats left available were “Hard Seat”, unless of course we wanted to buy “standing tickets”. Even the time in Changsha Railway Station was hard seat only. At least we had a seat in the station. Book your train ticket now > Use Trip’s online facility – its seriously easy! We spent the time in Changsha half lying on our backpacks slumped over two seats drifting off. There were 50 or so other folks doing the same thing, jolting awake each time there was an announcement, trains were departing every 15 minutes or so. No sleep was had. And it was brutal. Not the station, the whole experience. Truly, really, brutal. Hot, sweaty, packed. The hard seat compartment has four seats on one side of the aisle and six on the other. Our seats weren’t together, but not by far, and we did better than most. Chinese folks are smaller than us, so sitting next to the little Chinese man gave me more space than sitting next to Nige. And the carriage was packed with standing ticket only folks too. It’s friendly, people hold onto you when, nodding off to sleep it looks like you’re going to tip off the chair. But, it’s not pleasant by any stretch of the imagination. Book your tickets ahead of time. Now our next stop and final stop in China is Guilin. Hello! Whilst it may have been written a few years ago and I’ve yet to test how well the information has held this has got to be the most useful Zhangjiajie guide I’ve found thus far. Congratulations on a wonderful post + blog.